The town of Libby. The Highway 37 Fire is burning 1.5 miles away from the former W.R. Grace vermiculite mine. It’s considered a high priority due to its proximity to the old W.R. Grace vermiculite mine. Nate Gassmann, the Kootenai National Forest’s District Ranger in Libby says a crew of ten specially trained firefighters wearing respirators are working about a mile-and-a-half away from the mine. A total of 50 firefighters and other personnel from the U.S. Forest Service and Libby Volunteer Fire Department are using heavy equipment and hose lays on the ground. They’re aided by helicopters dipping water from the Kootenai River to douse hot spots. Crews are expecting a cold front to move in tonight carrying shifting gusting winds. The fire is threatening power lines but no structures There’s no timeline for containment. The Bitterroot National Forest says, “the Reynolds Lake Fire did not grow yesterday and remains at 1,068 acres. Crews made good progress constructing hand line around part of the west and north sides of the fire and containing a few spot fires south of Forest Road #044." Two additional Type 1 Hotshot crews have arrived. Resources on the fire today include 7 crews, 3 engines, 1 water tender, 5 helicopters. Air tankers are available again today as needed. Breezy winds are expected this afternoon as a dry cold front passes through the area. Winds will start picking up around noon and main push of the front will be around 3pm. Gusts around 20mph are forecast. Otherwise hot and dry conditions over the weekend with highs in the mid-80s. Firefighters will continue constructing hand line on the west and north sides today anchoring off Forest Road #044 to keep the fire out of the head of Blue Joint and Deer Creek. Engines will patrol Reynolds Lake Road containing any spot fires and mopping up. Aircraft will be used to moderate fire behavior and spread. This fire is being actively suppressed under a full suppression strategy. Continued fire spread to the north and east is anticipated, with active fire behavior including group torching and short crown runs. There are numerous snags are in the area which present a safety threat to firefighters in high wind situations." Montana Fish, Wildlife and Parks game wardens put out an illegal, abandoned campfire on Wild Horse Island State Park in Flathead Lake Thursday morning. The two wardens found the smoldering fire creeping out of a makeshift rock fire ring while responding to reports of illegal campers on the west side of the island. 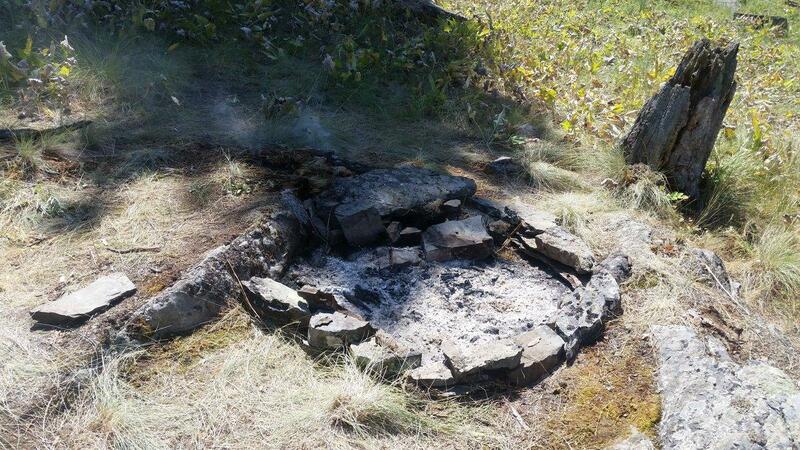 When they began to break up the ring, the smoldering logs immediately flared up, illustrating the serious nature of the threat, according to an FWP spokesperson. A similar illegal campfire sparked a five-acre blaze in the same area in July 2015. Fire danger is currently “High” in the Flathead Valley and “Very High” on the nearby Kootenai National Forest. Camping, smoking and fires are prohibited on Wild Horse Island State Park. FWP is investigating Thursday’s fire. Anyone with potential information about the incident is encouraged to call 1-800-TIP-MONT. Callers can remain anonymous. A fire outside Libby is drawing a quick response from crews working to keep the blaze away from the former vermiculite mine there and section of asbestos-contaminated forest. The Highway 37 Fire was spotted Thursday night about 3.5 miles up Highway 37. It’s approximately 40-60 acres. The fire is designated as a high priority. Highway 37 is reduced to single-lane travel while fire crews remove hazardous trees along the roadway. The Montana Department of Travel says to expect delays. Firefighters from the U.S. Forest Service and the Libby Volunteer Fire Department are fighting the blaze on the ground with heavy equipment. The Forest Service hopes to place a hose lay today to control hot spots. Helicopters and fixed-wing aircraft are dropping water and fire retardent to slow the fire’s growth. A powerline is the only structure threatened, according to the Kootenai National Forest. The Highway 37 Fire is burning about a mile-and-a-half away from the former W.R. Grace vermiculite mine, which is a designated federal Superfund Site due to high concentrations of Libby Amphibole Asbestos. Asbestos has accumulated in tree bark and duff in the forest near the old mine, and studies show the contaminant can be released into the air when burned. The fear is that asbestos fibers, which can cause scar tissue to build up in the lungs when inhaled over time, could be carried with a smoke plume and put firefighters and nearby people at risk of exposure. Multiple agencies, including the U.S. Forest Service, the Environmental Protection Agency, the state Department of Natural Resources and Conservation and Lincoln County have collaborated on a response plan to limit firefighter exposure and rapidly suppress fires in this area. While asbestos poses little threat when left undisturbed in the duff of the forest floor, firefighters face significant risk when digging fire line, laying hose or working to extinguish a blaze. A crew of firefighters is specially trained to respond to fires in this area. They wear respirators and undergo a thorough decontamination.